Laser Junction was established in 1995 and in the last 21 years the company has grown into one of the largest laser cutting and steel fabrication businesses in South Africa. The core business consists of laser cutting, sheet metal and tube fabrication. Laser technology assures precision cutting of a variety of materials including: carbon steel, stainless steel, aluminium and galvanised steel. The company operates from a new 10,000m² factory located at Dube TradePort, an industrial development zone. Managing Director Wayne Evans said, "The move to Dube TradePort was driven by the desire to be in a modern and sophisticated environment that was easily accessible. The new factory has been designed to obtain the maximum usage of natural lighting and airflows to ensure comfortable working conditions for the staff. In addition, the facility also ensures that we have adequate space to accommodate the long term expansion strategy of the business." Over R50 million has been invested in an impressive array of high tech equipment. The company uses mostly Trumpf machinery, which is considered the 'Rolls Royce' of the laser cutting industry. In addition to three flatbed lasers, the Trumpf Trulaser Tube 5000, is one of the few dedicated Laser Tube cutting machines in South Africa and the Trumpf 6000L Punching and Laser Cutting Combination machine provides a unique solutions for customer needs. In 2015 the business increased its process offering with the purchase of a new Koike High Definition Plasma machine. The specialised array of machinery together with full fabrication facilities ensures that Laser Junction is a market leader. Evans said, "Our competitive edge is in our flexibility, skills and knowledge that enables us to tackle a wide range of customer requirements. The management team is also very experienced in our range of products and projects." 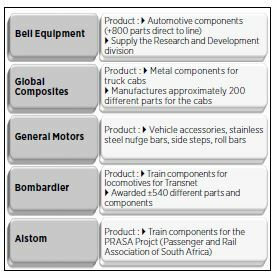 The business operates in all major industrial sectors in South Africa. These sectors include rail, heavy automotive, power infrastructure, construction, engineering, electronics and mining. Laser Junction has an experienced team of designers who are capable of turning an idea into a design that is ready for production using the latest design software (AutoCAD, Pro Engineer, and Autodesk Inventor). The team often works closely with the design teams of large customers to assist with research and development, design issues and product realisation. The design team will actively review and analyse customer designs and specifications to ensure best manufacturing practice is applied and cost efficiencies are realised. For smaller customers, the team will complete the design working from verbal instructions, a sketch or a sample part. The business employs over 250 well trained and highly experienced people, many of whom have worked at Laser Junction for many years. The low staff turnover rate has ensured the retention of skills and knowledge, which often can only be acquired through years of on-the-job training and close, daily interaction with managers and directors. Many of the staff at Laser Junction arrived with little or no skills and a robust skills development programme is an essential initiative of the board of directors. This programme ensures that staff are continually trained in various aspects, both relevant to their current roles or cross trained into other roles. The internal training has uplifted these individuals to now possess skills relevant to the metal manufacturing industry such as welders and machine operators. The company works in conjunction with the MERSTA (manufacturing, engineering and related services sector education and training authority) to offer learnerships. The company has initiated a plan to assist with the enterprise development of certain plating and component machining suppliers who fall within the definition of black owned exempted micro enterprises (EMEs). As part of its socio economic plan, the company is continuously looking at development initiatives and currently supports a local orphanage, "Vukukhanye". The results of the benchmarking exercise were very favourable and the business was placed in the top quadrant of the global analysis. The company obtained its SABS ISO 9001 accreditation in 2010. "To become a world class steel fabrication company."